In this article originally published in a column co-hosted by Agri-Pulse and The Chicago Council on Global Affairs, Pastor John Crosby shares his experience witnessing poverty and hunger and reminds us of Jesus’ call to feed the hungry. “Give them something to eat,” Jesus said. As a pastor, I’m struck by these well-known words, spoken to disciples who were at a loss how to respond to thousands growing hungry in their midst. They wanted to send the crowds away, to fend for themselves, but Jesus commanded a different response. “Give them something to eat,” he said, knowing full well there wasn’t enough for everyone. Still, somehow, the great Miracle-Worker multiplied their meal, and what began as five loaves of bread and two fish became full stomachs and twelve baskets of leftovers for over 5000. Compassion created abundance rather than scarcity, and those with resources were invited – challenged – to participate in meeting the needs of those with none. Experience a renewed commitment to crop insurance. With a congregation in the heart of the “nation’s breadbasket,” I am profoundly aware of the foundational role that food plays in all aspects of life regardless of where one lives. Food and agriculture sectors in the U.S. fosters vibrant and strong communities domestically, providing jobs and economic opportunities for our families. Internationally, agriculture remains the economic backbone for many, but when harvests fall short – Americans unerringly meet desperate need with support. The food assistance our nation provides nourishes and strengthens the bodies of vulnerable children and their own families, and just as with the miraculous “feeding of the 5,000,” compassion has a mysterious way of producing abundance for all of us. There are crowds much larger than 5,000 today who are hungry on a daily basis. While the world has made impressive progress against hunger, 795 million people lack enough food to have an active, healthy life. Hunger contributes to nearly 8,000 preventable deaths of children under the age of 5 every single day, weakening bodies, stunting physical and cognitive growth, and robbing one in four of the world’s children from reaching their God-given potential. It may seem impossible to meet this need, but I’ve witnessed the miraculous multiplication of hope and compassion in responding to hunger. Addressing food insecurity requires multiple approaches that consider both the immediate needs and the systemic issues that perpetuate the problem. In Moyo, Zambia, our church saw the power of home-made trickle irrigation in boosting crop cultivation, and as a result, for the first time, this new practice ensured families could grow enough to sell at the market. 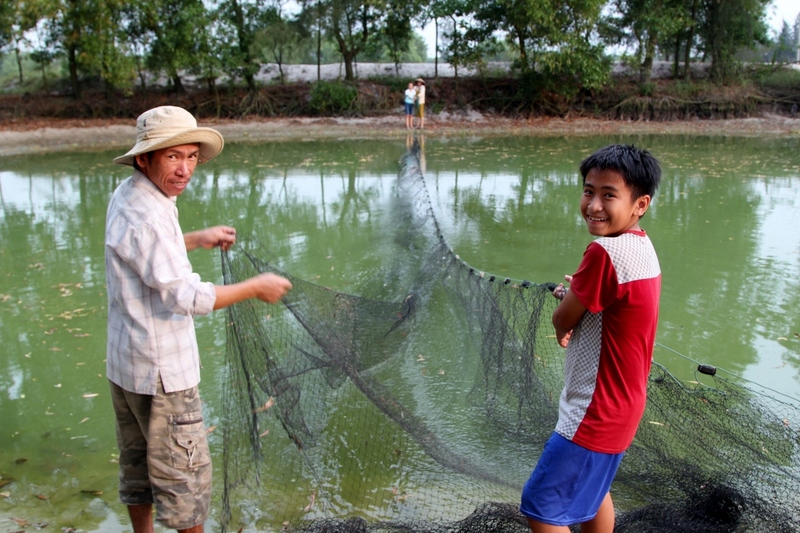 We were amazed at the impact of elementary, sustainable mini-fish farms our partner World Vision designed to provide both saleable product and fertilizer for expanded production. Our church offered a small investment, but it is yielding significant results which are being multiplied around the world through other similar programs and initiatives. Sustainable solutions like these must continue to be scaled up to defeat hunger globally. This past summer, the U.S. Congress, with bipartisan support, passed the Global Food Security Act. Importantly, beyond supporting current agriculture development programs, the legislation also prioritizes partnerships with private sector companies and universities (including some located here in Minnesota). I appreciate knowing that my tax dollars are being put to good use – “giving a fish” to those in desperate situations, and “teaching to fish” alongside of those who long for the dignity of providing for their families. “Give them something to eat.” A profound invitation from a compassionate carpenter, who knew enough about farming to know that when we share what we have, God will bless us to reap what we sow. John Crosby has been the senior pastor at Christ Presbyterian Church in Edina, Minnesota since 1989, seeing it grow to more than 5000 members of all ages and backgrounds. Under his leadership, Christ Presbyterian has been deeply involved in ministries of justice and compassion locally and throughout the world. He is excited to be part of God’s work in creating a culture that develops young leaders, fosters entrepreneurship and encourages kingdom impact. He has previously served on multiple boards including Opportunity International and Lawndale Community Church and is currently serving on the domestic and international World Vision Boards. John has degrees from Wheaton College, Gordon Conwell Seminary and a doctorate from Fuller Theological seminary. Avid golfers, John and his wife Laura are the proud parents of two exceptional daughters, and love to travel with them around the world.